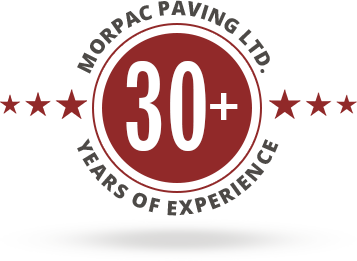 Concrete Work – Morpac Paving Ltd.
Morpac Paving Limited enjoys an impressive reputation in Toronto for skilled concrete paving, maintenance and repairs for residential as well as commercial applications. Concrete is more than a simple solid surface- it is an epitome of permanence and stability. Our highly experienced concrete technicians are adept at following a rigorous process of installing concrete wherein their first focus is on preparing a smooth surface so that our installed concrete retains its appearance and integrity for years. We provide all types of concrete services that a home or a commercial building may require. We are especially proficient and experienced in projects like garage floors, driveway curbing, walkways and commercial concrete repairs. Our stamped concrete work is greatly appreciated for our artful use of decorative concrete to hide cracks and fillings and to give a beautifying effect to walkways and driveways without the need for a new installation. We can also use stamped concrete for new installations so you may choose to decorate even your new walk and driveways. Add artistic beauty to your surroundings with uncompromising stability and strength of concrete.